The third annual SRG Beach Sevens Festival at Borough Rugby Club was another huge success. 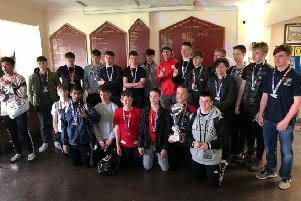 Hundreds flocked to Fengate over the weekend to watch 26 teams from all over the UK battle it out in four categories and there was plenty of local success. The main competition winners were Oxfam Crusaders, a national squad made up of players from different clubs all over the country, but they were given a run for their money by local side SRG Mercenaries - a team that included Reggie Reed, Duncan Low, Dewi Pearce, Owain Pearce, Stefan Gallucci, Andy Richmond and Adam Peel. Crusaders now go through to the RFU Regional Sevens finals. Stamford Colts, Stamford College Old Boys and Hampton Hurricanes all picked up[ trohies. The Stamford College side was made up of Liam Greenslade, Tyler Houston, Haydn Johns, Aled Pattinson, John Hickman, Alan Flanders and Callum Fraser while ex-Borough players Steve Pretsell, Joel Burpitt, Paul Booth, Reece Harry and Levan Stapleton were in the Hampton squad. The Zulu Warriors side that won the social tournament included current Borough first team players Joe Andresen and Tanaka Kanhukamwe. Homelink Touch Plate Winners - Hampton Hurricanes. Festival organiser Sam Sargeant of SRG Events said: “The rugby was again of a high standard, but the whole weekend had a great fun- chilled vibe to it.